The beaches of Orosei are exceptionally beautiful, even by Sardinian standards. Orosei offers a thrilling coastline that – together with the wonderful beaches of Cala Ginepro and Sa Mattanosa, onto which Camping Cala Ginepro naturally faces – affords a wide variety of environments, which are easily reached from the campsite. Below, you will find a list of Orosei’s most stunning beaches, in the pristine surroundings of Sardinia’s east coast! Sa Curcurica is adjacent to Cala Ginepro beach, in a northerly direction; it can be reached in just a few minutes from the campsite by means of a pleasant stroll along the shore. The fine, silvery sand and shallow seabed are the distinguishing features of this pearl of Orosei. Behind it, there are delicate promontories of pink granite and the shaded, well-equipped pine forest. Ideal also for families with children, the Sa Curcurica beach features a large basin, which is the largest in the area, fed by two streams: Rio Pischina and Rio Sa Mela. With the emerald colours of the pond's water, the wetlands of Sa Curcurica are lovely and give you the opportunity to admire various species of aquatic birds, both migratory and non-migratory, such as the black-winged stilt, the great cormorant, the heron and the flamingo. Sa Curcurica is surrounded by granite hills covered in Mediterranean maquis, creating a highly picturesque landscape. The Sa Curcurica basin marks the southern extent of the Biderosa Nature Reserve. Indeed, once you pass the outlet of the pond, you reach the first cove of the reserve. Biderosa encompasses five dreamlike beaches within a protected parkland covering 860 hectares. We describe the reserve in detail, including information on how to reach it, in the Biderosa Nature Reserve section. Once you pass beyond the last beach of Biderosa, you come to the reef of Pedra Marchesa. Pedra Marchesa is a solitary, white corner of paradise, which seems lost in time and space – and yet it is just a stone’s throw from all of the amenities and from Camping Cala Ginepro! Pedra Marchesa leads to Berchida beach, on the border between the municipality of Siniscola and that of Orosei. 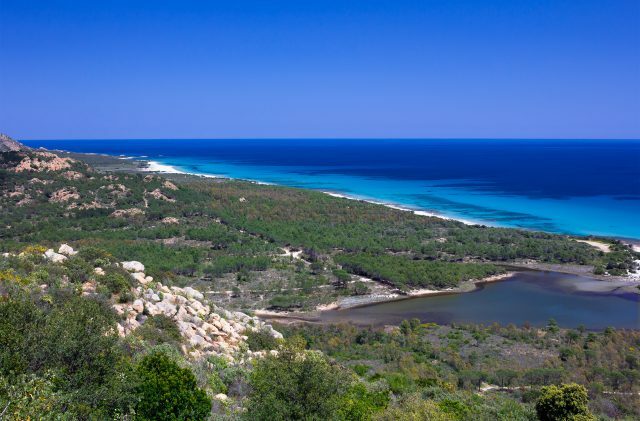 Heading northwards from Camping Cala Ginepro, the wonderful coastline of eastern Sardinia continues to amaze us, this time with Berchida beach. The crystal-clear sea, typical of Cala Ginepro and the surrounding beaches, offers a spectacle of rare beauty. At certain times of year, it is not uncommon to see on this beach (or at the basin of Berchida) some peaceful cows doing their thing. This may appear to be a bizarre phenomenon, but it is in fact simply part of the seasonal migration of these herbivores – who normally live on a nearby farm – from the mountains to the coastal areas. The seemingly endless stretch of white beach makes Berchida beach one of the wildest and most beautiful panoramas in all of Sardinia. From Camping Cala Ginepro, Berchida beach can be reached: by taking a long stroll along the shore, following the route for Biderosa; by car, in about 10 minutes along the “SS125” road; or by mountain bike, which can be hired from Reception at Camping Cala Ginepro. In busy periods, access over land to Berchida beach (previously in the municipality of Siniscola) is subject to a charge, as is the adjacent Biderosa Nature Reserve in Orosei. From the glorious Cala Ginepro beach, heading this time southwards, you reach the start of the stunning reef overlooked by Camping Cala Ginepro. Through the narrow pathways, amid the rocks and the ever-present fragrance of Mediterranean maquis, you come to the free beach of Sa Mattanosa, which is directly accessible from the campsite via the route next to the sports pitch. The enchanting stretch of fine white sand, the ever-changing shades of the sea and the immensity of the spaces combine to make Sa Mattanosa beach a real favourite of our campers. We describe the beaches of Cala Ginepro and Sa Mattanosa in more detail in the dedicated section. Proceeding southwards from Sa Mattanosa on a route featuring small clearings and rocky stretches, you come to the beaches of Cala Liberotto. Cala Liberotto boasts transparent seas and a shallow seabed, with rocks and granite promontories emerging above the waves. The crystal-clear water of the beaches of Orosei is a feature of this tract of coast, too. Cala Liberotto continues southwards with Fuile 'e Mare beach, delineated at the edges by low-level rocky promontories and featuring a pine forest to the rear. Like the adjacent beach of Sas Linnas Siccas, here, too, the sand is light in colour and fine-grained. After the basalt rocks of the reef of Punta Nera, Marina di Orosei extends for more than 7 kilometres, with the Su Barone Nature Reserve and the beaches of Su Petrosu (also known as Isporoddai) and Osala. The Marina of Orosei, with its delightful inland landscape, features enormous stretches of coarse-grained sand and a deep seabed, which falls away rapidly – this is why Sa Marina di Orosei is such a favourite with divers. A short distance off the coast of Marina di Orosei, across from Osalla beach, there lies the submerged wreck of the KT12, at a depth of around 34 metres. The wreck of the KT12 is in perfect condition to this day, and looks just as it would have done prior to sinking. The vessel was designed in Hamburg and built in Italy; it was intended to transport equipment, vehicles and fuel to North Africa, but it never reached its destination. It was sunk by a British submarine on 10 June, 1943, in the middle of the Second World War. The KT12 caught fire, but a number of crew members managed to survive and were aided by the locals of Orosei. For sub-aqua divers, the KT12 in the Gulf of Orosei is one of the most interesting wrecks to visit in the Mediterranean! The Gulf of Orosei encompasses numerous bays, which can often only be reached by boat. These bays straddle several different administrative areas, from the municipality of Orosei itself all the way to Capo Monte Santo, in the municipality of Baunei. The Gulf of Orosei stretches across more than 40 km of coastline. We describe the Gulf of Orosei and boat trips in the gulf in more detail in the dedicated section.